We have become so used to Westerns revising and challenging the genre with films such as Unforgiven (1992) and The Assassination of Jesse James by the Coward Robert Ford (2007) that it came as a strange lurch when the Coen brothers, with typical atypicality, chose to produce an almost by-the-numbers genre piece with their recent version of True Grit (2010). 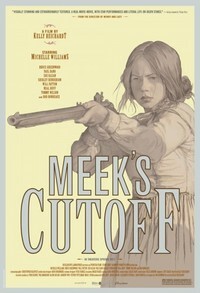 So it is with something like a sense of normal service resumed that I watched Meek’s Cutoff, the new film by stalwart independent film-maker, Kelly Reichardt. Set in Oregon in 1845, the film follows the travails of three families who part company with the main wagon train to go it alone, guided by an experienced cowboy, Stephen Meek (Bruce Greenwood), who claims to have a shortcut - the eponymous ‘cutoff’. But manifest destiny is anything but manifest to these pioneers. Despite its beauty, the landscape is implacably hostile and survival looks uncertain. The moustachioed and epically bearded Meek could be their saviour but he could just as easily be a bluffer and conman, leading them to disaster and death. Tensions mount further when an Indian is captured who could represent salvation, or an enemy ready to murder them in their sleep. Despite the Western’s tendency to reinvent itself, even revisionist Westerns often end up reasserting the values of the Old West: think of the final gunfight in Unforgiven, which, despite the film’s anti-violence premise, comes as a satisfying resolution. Meek’s Cutoff is a more radical experiment in the genre. Not only is the point of view switched to the women of the party (led by a marvellous Michelle Williams), who watch as the men fumble until, exasperated, they begin to impose their own ideas, but period is genuinely respected. This is not the postmodern eternal present, where people, who are essentially just like us, wear different clothes. Everything is different. The progress of the film takes on the nightmarish and hypnotically plodding pace of the pioneers themselves. The events of the plot stand out like rare landmarks in an otherwise bleak prospect. Drama and tension accumulate from the gradual desperation of the families’ predicament, until the audience feels the loss of a water barrel almost as viscerally as the characters themselves. This is certainly not a film for everyone. There are no fistfights, no series of macho confrontations, and when a gun is fired it is a tense and dirty business waiting for it to be reloaded. But in Reichardt’s feel for the period and the authenticity of her characters, who remain ignorant of their wider historical position, the film has an odd and resonant power. This review was published on April 16, 2011.